Our next IPVM access control course registration is closed. It meets live online, starting on October 15th for 12 times over 7 weeks (Tuesday and Thursday from 1pm - 2pm ET) teaching access control - regulations, doors, locks, readers, controllers, networking, management software and more. Plus, all classes will be recorded so you can watch on-demand. Those who successfully participate and pass the final shall become IPVM Access Control Certified (see list of IPVM Certified Professionals). Unlike manufacturer classes that focus only on vendor-specific equipment, IPVMU educates on the entire system. Not only do we address the design fundamentals of controller boards, interfaces, and databases, we examine how to choose the right mix of devices for an optimal system: We address the door itself, and move backward into credential types, readers, and locks - and how life/safety codes impact their use. At the end of classes, you will take a comprehensive final exam. If you pass, you will become IPMVU Access Fundamentals certified. 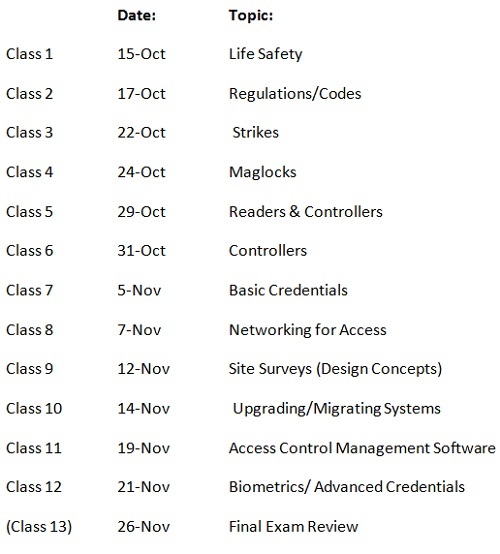 There simply is not a more practical, fundamentals based Electronic Access Control class in the market today. The course costs $299 and is only open to IPVM PRO members. All live classes are recorded, student gain access to a special 'class-only' discussion group, and there is private feedback from us.